Frank Garza is one cool pool guy. In fact, Frank is an aquatic engineer at Cool Pool People– a three-person pool service team in Frisco, Texas– and he really is pretty cool. Frank has figured out how to automate Cool Pool People’s record-keeping process by building and deploying his own mobile app with AppSheet. Before discovering AppSheet in the Google Sheets add-on store, Frank, his boss Todd, and his colleague Arturo (Director of Filter Cleaning) were keeping records with paper, simply printing out years’ worth of records and trying to keep track of them, sheet by sheet. This method meant the team wasn’t able to easily view the details of previous visits at subsequent visits to a particular home. They didn’t have a streamlined way to view past records and therefore know instantly what a pool might need with regards to its last treatment, or anticipate what kinds of things could be expected in the future. They needed to have this intuitive information at their fingertips in order to provide better, more customized service. Frank was playing around with Google Sheets when he decided to look for more options in the add-on store. He found AppSheet and began testing it out. As time went on, he realized just how much his DIY app could help to transform the way Cool Pool People does business. 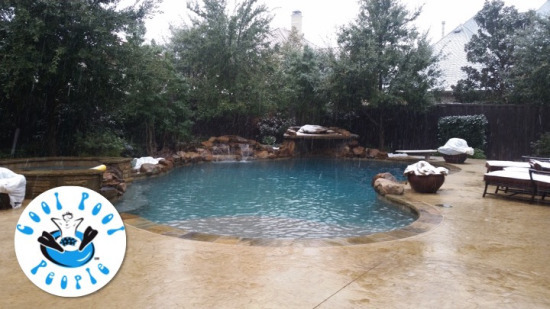 Cool Pool People is voted #1 by the Frisco Enterprise newspaper and Frisco’s Living magazine. Also, Angie’s List has awarded Cool Pool People their Super Service award on multiple occasions — a huge feat considering the three-man team competes against large pool building and service corporations. But they know that to maintain their distinctions, they need simpler, more efficient ways to keep track of data and customer information. One of the worst problems a pool can face is algae, particularly because there’s no way to test for it, and once it’s detected, it’s already too late. “Dealing with algae is very time consuming, very laborious. If we can learn from these records, for example ‘at this particular time, this pool started getting algae during this season,’ then maybe we can get ahead of it,” Frank says. He knows that being able to access past information about a pool will help him to anticipate future issues and take proactive measures to prevent them. This means saving both his customers and his company lots of unnecessary costs. Frank sees a lot of potential for future apps, and is also working on a new one to distribute to customers in place of the paper cards they’re currently giving to report on individual pool jobs. Once that app is up and running, Cool Pool People will be completely mobilized, having ditched paper methods once and for all. Because that’s just what cool pool people do.